Total expenditures authorized by the budget increased by 11 percent for a total of more than $251 billion in 2017. Despite the increase in expenditures, the budget makes it more difficult for low-income families to overcome poverty and achieve economic independence. Changes in the country’s tax laws shift more of the tax burden to households and disproportionately burden low-income families. Current expenditures alone consume all general revenues, limiting the sources of funding for major investment to grants and new debts. Accordingly, the share of total expenditures funded by public debt increased by 79 percent. These findings raise key questions as to whether current allocations represent the best use of public funds and the implications of the current allocations and spending levels on future budget decisions. The budget includes changes in the tax laws that increased consumption tax revenues by 21 percent (almost $14 billion) over 2016. Simultaneously, income tax revenues are reduced by 3 percent (almost $1.8 billion). These changes make the tax system more regressive. With a consumption tax, low-income families pay a higher share of their income in taxes than everyone else. Accordingly, this makes it more difficult to reduce inequality, lift struggling families out of poverty and put them on a path to economic independence. The cost of salaries and benefits for public servants grew by almost $6 billion, the highest among current expenditures – day-to-day cost of running the government with a minimum level of services. This increase is largely the result of increases in salaries and benefits for members of the national assembly and special offices. In 2015, the government increased salaries for members of the national assembly and special offices up to 50 percent. Members of the national assembly and special offices do not include teachers, nurses, or policemen. Thus, increased expenditures for salaries and benefits is unlikely to have any impact on the quality and level of public services. Moreover, the added benefits of increased expenditure for salaries and benefits to taxpayers is unclear. Total current expenditures equal total general revenues. This limits the government’s ability to increase investments in critical services such as transportation, education, healthcare and public safety to debt and grant funding. Grants are an unreliable source of financing for major investments. Public debt is a critical source of financing major investment; however, accumulating excess debts over a short period of time increases the cost of debt services. Higher levels of debt services further limit revenues available for investing in critical public services. With the current high-risk growth and slowdown in key economic sectors, smart fiscal consolidation is almost necessary to avoid priming the economy for and preventing a debt induced crisis. Better control of the public sector wage bill and increased efficiency in the public sector are sensible options to ensure the economy is on a solid long-term footing. The budget includes a reduction of revenues from the private sector (businesses) by almost $3 billion. While cutting revenues from businesses may have a pro-business connotation, it undermines the government’s ability to invest in needed public services that benefit businesses and are critical for supporting economic growth, such as building quality roads and bridges linking communities, providing quality and affordable education services, providing quality and affordable healthcare, and adequate public safety. The claim that business would invest in new plant and equipment and create more jobs simply because they have extra income is a myth. Businesses do not hire more workers or invest in new ventures because they have more income. Instead, businesses invest in new ventures and hire more workers when there is sufficient demand for their products. Thus, the reduction in revenues from businesses is unlikely to spur growth or job creation. The level of grant funding for 2017 assumed in the budget appears unrealistic and likely understates the corresponding level of public debt to balance the budget. For 2017, the budget includes an estimated $14 billion in grants, representing an increase of 83 percent ($6.4 billion) over 2016. In 2016, the budget included estimated grants totaling almost $17 billion, representing an increase of almost 167 percent (almost $11 billion) over 2015. However, actual grants received in 2016 totaled $7.7 billion, less than half the amount that was projected, and represented an increase of 24 percent over 2015. The budget includes new debt totaling more than $54 billion, representing 22 percent of total expenditures. 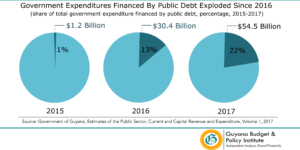 In 2016, the share of total expenditures funded by public debt was 13 percent and in 2015 it was 1 percent. While the use of debt to fund major expenditures makes economic sense, the accumulation of a high level of debt over a short time period can have severe economic consequences. Though accumulated for good reasons, high levels of public debt represent a deadweight burden on the economy and can dim both future investment and growth. The budget includes general revenues of almost $183 billion for 2017, which represents a decline of 3 percent (almost $6 billion) over 2016. 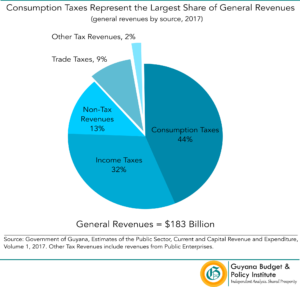 The largest sources of total government revenues are consumption taxes representing 44 percent ($80 billion) followed by income taxes representing 32 percent (almost $59 billion). The budget includes new public debt totaling more than $54 billion, an increase of more than 79 percent (more than $24 billion) over 2016. Of this amount, 80 percent is projected to come from domestic lenders and 20 from international lenders. In 2017, the share of government expenditure funded by new public debt increased to 22 percent, up from 13 percent in 2016. In 2015, the share of government expenditure funded by new public debt was 1 percent. This section of the report examined how funds appropriated in the national budget are spent according to the type of expenditure. 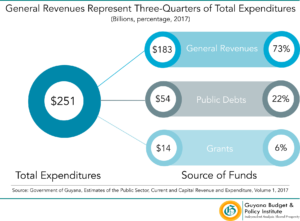 Expenditures types are not service priorities such as such as education, health, and human services, or public safety, but are financial classifications of expenditures. For example, the share of the national budget spent on ‘salaries and benefits’ versus the share of the national budget spent on building roads and bridges. Salaries and Benefits of almost $55 billion – representing 22 percent of total expenditures. Transfer Payments of $71 billion – representing 28 percent of total expenditures. Capital Expenditures of more than $65 billion – representing 26 percent of total expenditures. Debt Services of more than $8 billion – representing 3 percent of total expenditures. Other Goods and Services of almost $52 billion – representing 21 percent of total expenditures. Salaries and benefits expenditures include expenditures for salaries, allowances, pensions, and gratuities for public servants. Total salaries and benefits expenditures of almost $55 billion represent an increase of 12 percent (almost $6 billion) over 2016. This is the largest increase among all types of current expenditures over the previous year. Also, salaries and benefits expenditures represent 30 percent of general revenues. Total transfer payments of $71 billion represent an increase of 3 percent (almost $2.3 billion) over 2016. Transfer payments are the largest type of current expenditure and include mostly funding allocations to the 10 administrative regions, government subsidies for certain businesses, and public assistance for the elderly. In percentage terms, transfer payments grew the least among all types of expenditure. The regional democratic councils implement and oversee some of central government’s work program in the respective regions, particularly in the areas of public works, education delivery, and health services. Total capital expenditures of almost $65 billion represent an increase of 23 percent ($12 billion) over 2016. Capital expenditures are expenditures on new or existing assets to enhance or extend their useful life. Thus, capital expenditures have benefits extending through multiple years in the future. Capital expenditures include expenses for repairing roads, waterways, and buildings, and may also include expenses for research and development. Debt services are interest payments on loans from domestic and international lenders. 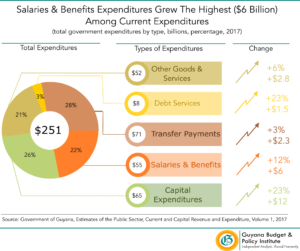 Total debts services expenditures of more than $8 billion represent an increase of 23 percent (more than $1.5 billion) over 2016. Of this total, 74 percent is for interest payments on loans borrowed from international lenders and 26 percent is for domestic loans. Total expenditures on ‘other goods and services’ of almost $52 billion represent an increase of 6 percent (almost $2.8 billion) over 2016. Other goods and services include payments for goods and services with benefits lasting only for a year but necessary for government agencies to provide services. For example, expenses for education supplies, materials, tools, equipment, food items, etc. The Official Gazette (Extraordinary) of Guyana, The Official Gazette 25th September 2015 Legal Supplement – B. p. 2-3. Carmen M. Reinhart & Kenneth S. Rogoff, 2010. “Growth in a Time of Debt”, American Economic Review, American Economic Association, vol. 100(2), pages 573-78. Refers to the amount of debt issued of 2017 alone. This amount should not be confused with the total amount of debt for the country. Jacobs, Davina. F (2009): Capital Expenditure and the Budget: Public Financial Management Technical Guide Note, Fiscal Affairs Department. International Monetary Fund. p. 3.